Berry’s 13th Cotton Malone thriller wasn’t a lucky outing for me. By switching to the use of first person and a single point of view he both slowed things down and made narrative repetitions more obvious. That’s too bad, because the basic idea for this novel was very solid. This book’s release coincides with the 50th anniversary of Dr. Martin Luther King., Jr.’s assassination, which occurs April 4th. Berry created a conspiracy behind King’s death, with plot twists and surprise revelations throughout. FBI operatives past and present are the major players, with secrets to protect at any cost. While the novel opens in the present, the bulk takes place 18 years earlier. This predates all the other Malone outings. In fact, it’s Malone’s first assignment with the Magellan Billet. He’s a rookie and it shows. 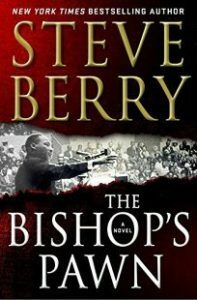 Berry always takes a historic reality and wraps it in imaginative conspiracies and dangerous conflicts. I worried this particular reality was too recent and too raw for that treatment. However, his story line was respectful and even believable. By incorporating some of the genuine disgraceful tasks the FBI carried out during the J. Edgar Hoover years, Berry reminds readers of some largely forgotten history. Unfortunately by eliminating the multiple points-of-view of his previous novels, Berry limited what could his characters could do and say, which led to some stilted scenes and repetitive dialogue. Cotton Malone is asked to retrieve a rare gold coin from a recently sunken boat. He’s barely gotten in the water before the shooting starts and the chase begins. The numerous antagonists all have different objectives — none of which are good for Malone’s well-being. And, it all revolves around King’s assassination. This entry was posted on Saturday, March 24th, 2018 at 12:15 pm	and is filed under Book Reviews. You can follow any responses to this entry through the RSS 2.0 feed. You can leave a response, or trackback from your own site.